We found that four core principles underpin effective goal systems, and we summarize these elements with the acronym FAST. (See “Make Goals FAST, Not SMART.”) Goals should be embedded in frequent discussions; ambitious in scope; measured by specific metrics and milestones; and transparent for everyone in the organization to see. According to conventional wisdom, goals should be specific, measurable, achievable, realistic, and time-bound. But SMART goals undervalue ambition, focus narrowly on individual performance, and ignore the importance of discussing goals throughout the year. To drive strategy execution, leaders should instead set goals that are FAST — frequently discussed, ambitious, specific, and transparent. Goals are powerful tools for driving strategy execution — but they have to be frequently assessed, ambitious, specific, and transparent. Take the quiz to find out if your company’s approach to goal setting passes the FAST test. As it has grown — through a series of mergers and acquisitions — into AB InBev, the largest and most profitable beer-maker in the world, the company has maintained the practice of making employees’ goals public. Google follows a similar approach, posting all employees’ current and past goals on its internal employee directory right beside their title and contact information. Aggregating these individual choices across a range of companies, we found that users made more than 90% of their goals public. The percentage of public goals, moreover, was virtually the same whether an organization was public or private, small or large, a Silicon Valley technology company, or a more traditional enterprise. To be sure, some goals should remain private (particularly those dealing with sensitive personnel decisions, legal issues, or pending acquisitions). But in the vast majority of cases, users believe the benefits of transparency outweigh the costs. Making goals public can boost performance by introducing peer pressure, showing employees what level of performance is possible, and helping them locate colleagues in similar situations who can provide advice on how they can do better. When Telles extended public goals from Brahma’s headquarters to its individual breweries, for instance, managers of underperforming plants reached out to their counterparts in higher performing facilities for tips on how to improve efficiency. When employees can see top-level goals, they can align their individual and team objectives with the company’s overall direction. Clarity on how their work contributes to the success of the organization as a whole, moreover, is one of the top drivers of employee engagement.8 Unfortunately, corporate goals are poorly understood in many companies. In a recent study of 124 large organizations, we found that less than one-quarter of middle managers knew their company’s strategic priorities.9 Making the goals public can help. 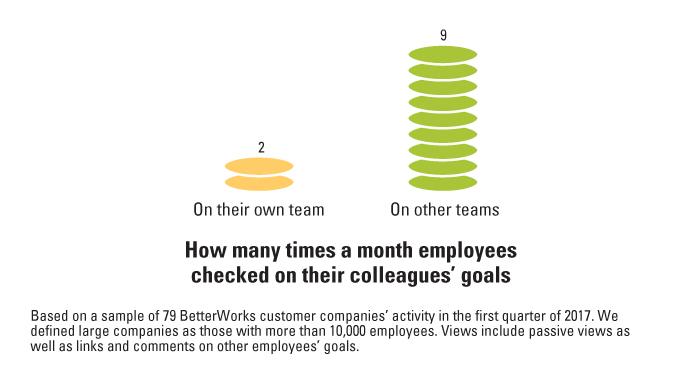 Nearly all of BetterWorks’ customers make corporate priorities visible to all employees, and the typical user views them more than twice per quarter. Sharing company goals publicly cannot guarantee that employees will align their objectives to the company’s strategy. But transparent goals do make it easier for employees to check the objectives of their department, function, or business unit against those of the company as a whole. When goals are public, senior executives can easily review them to spot objectives that are out of line with the company’s overall direction. Transparency, in short, can foster strategic alignment without resorting to a time-intensive process of cascading goals down the chain of command. When goals are kept private, employees are often in the dark about what people on other teams are doing. We have administered a strategy execution survey to more than 400 organizations (mostly large U.S.-based companies) to assess how well they implement their strategic priorities.10 In our sample, only one-quarter of the managers said that their goals were understood by their counterparts in other divisions, functions, or business units. When employees don’t know one another’s goals, they are more likely to make unrealistic demands, focus on activities that don’t support their colleagues, or duplicate effort. In most organizations, goals are private. When goals are made public, employees use the transparency to keep tabs on colleagues on other teams. In large companies, employees viewed the goals of colleagues on other teams four times as often as they checked in on their own team members. Many companies rely on frequent meetings, highly structured processes, or frequent email blasts to make sure employees’ goals align with the company’s strategic direction and the objectives of other parts of the business. 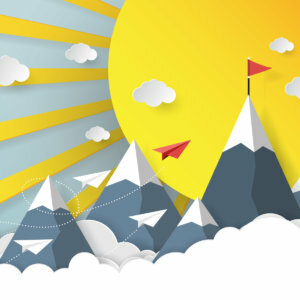 When goals are public, employees can connect the dots for themselves to see how their work supports the strategy and colleagues in other teams. In the early 1970s, Intel was making the transition from memory chips to microprocessors. Andrew Grove — then the chipmaker’s executive vice president of operations — read about management by objectives and immediately saw the concept’s potential to help Intel implement its new strategy.11 Grove implemented Intel Management by Objectives, which required employees to translate their goals into concrete actions and metrics to clarify how they would achieve their targets and measure progress along the way. As an Intel employee, Doerr was deeply impressed by Grove’s system. When he joined Kleiner Perkins in 1980, Doerr refined Intel’s approach into OKRs, which were tailored to the needs of the firm’s portfolio companies. Eventually, Doerr introduced OKRs to companies he backed, including Amazon.com, Intuit, and Google, and the methodology has spread widely throughout Silicon Valley’s technology ecosystem. OKRs consist of two parts. Objectives are short descriptions of what you want to achieve. Each objective should include a handful of key results — typically quantitative metrics or milestones that specify the steps required to achieve the goal and measure progress. Don’t get hung up on the terminology of OKRs. Many Silicon Valley companies refer to goals as objectives, while other companies refer to them as targets. (We use the terms goals, objectives, and targets interchangeably.) Likewise, some companies use metrics or key performance indicators (KPIs) instead of key results. Regardless of the terminology, the important thing is that employees translate their goals into clearly defined tasks and concrete measures of progress. Some companies, particularly those run by engineers, insist that every key result be quantifiable. Our experience working with companies, however, suggests that relying exclusively on quantitative measures is neither necessary nor optimal. For a fast-growing startup, for example, the qualitative milestone of hiring a new chief technology officer can be every bit as important as any quantitative KPI. Among BetterWorks users, about half of key results are quantitative. The discipline of translating goals into metrics and milestones can enhance the performance of individuals or teams in several ways. For big-picture thinkers, breaking goals into concrete tasks and metrics helps them think through the details of how to achieve their objectives. Conversely, more tactically oriented employees can link their activities and KPIs to the outcomes that matter most for the company as a whole. Working through concrete actions and metrics, moreover, helps employees understand exactly what their boss and colleagues expect from them, and decreases the odds that they will agree on broad generalities that each interprets in their own way. Defining specific metrics and milestones for each goal can also enhance agility. Key results can be treated as hypotheses: “If we do this, then we will accomplish our goal.” The more specific the hypotheses are, the easier it is to test them, determine which ones are (or aren’t) working, and make midcourse corrections. “Truth,” as Sir Francis Bacon noted, “emerges more readily from error than from confusion.” Translating general goals into testable hypotheses surfaces errors more quickly and precisely, which accelerates the pace of learning and adjustment. Linking goals to key results makes it easier to adjust as circumstances change, without losing sight of the company’s must-win battles. The marketing manager of a startup might have a goal to attract 1 million unique visitors per month to the company’s website. To support that, however, she might have several key results — for example, “gain 100,000 followers on Twitter” or “restructure website architecture to optimize for search.” While the same objective might extend over several quarters, the key results will change as the team accomplishes them or learns that other approaches or metrics are more relevant. When we ask managers how often they look at their goals, most say twice per year — once when they set their objectives and again when they write up their performance self-appraisal. For many organizations, goal setting is an annual ritual that begins with a one-on-one meeting between an employee and his or her boss to agree on objectives for the year.14 Employees dutifully enter their goals into a spreadsheet or performance management tool, and largely forget about them until year end. Come December, they revisit their objectives and are often surprised by the tenuous relationship between their stated goals and what they actually did in the meantime. Setting and reviewing goals on a quarterly basis provides more opportunities to make course corrections throughout the year. In our sample, companies in dynamic sectors such as media, information technology, and financial services were most likely to set quarterly goals. More stable industries favored annual goals. Resetting goals on a quarterly basis can be useful. But it is not the only way to embed objectives in ongoing discussions. Employees at AB InBev, for example, set their targets annually, and Google, for its part, recently moved from quarterly to annual goals.16 What really matters is not whether goals are set quarterly or annually, but whether they shape the key discussions for getting work done. LinkedIn CEO Jeff Weiner, for example, meets weekly with his executive team to discuss how his team members are doing against their goals and metrics.17 Goals can also provide the framework for making difficult trade-offs regarding which initiatives to prioritize, how to allocate resources, and how to respond to requests from colleagues in other teams. A core tenet of the SMART framework is that goals should be achievable and realistic. Several recent articles have argued against stretch goals and recommended incremental targets instead.19 The widespread practice of requiring employees to achieve 100% of their goals to earn a bonus or a positive performance review reinforces employees’ tendency to set conservative goals that they are sure to achieve. Ambition is fiendishly difficult to measure. You can usually observe only what was achieved not what was possible. We have used multiple measures to estimate organizational ambition, and all point in the same direction — the typical company should focus on setting more ambitious goals. Our survey of more than 400 organizations asked managers what advice they would give a newly hired colleague on setting goals. They could advise new managers to (1) make conservative commitments they are sure to achieve, (2) set ambitious goals even if they are not sure how they’ll achieve them, or (3) avoid committing to objectives whenever possible. In the typical organization, nearly two-thirds of managers would advise a new colleague to play it safe. In our execution survey, we asked managers to choose the three factors (from a randomized list of 10) that most influenced promotion decisions in their organization. Pursuing ambitious goals came second to last. How can leaders inspire people to set more ambitious goals? In Silicon Valley many companies encourage employees to set goals that they are unlikely to achieve in full. Google, for example, expects employees to achieve an average of 60% to 70% of their key results. In the eyes of Google executives, asking for more would prevent employees from thinking big enough when setting their objectives. Although Google’s approach is common among Silicon Valley technology companies, it is not the only way to foster ambitious goals. At AB InBev, bonuses are tightly linked to targets for reducing costs, improving operations, and optimizing pricing. The brewer injects ambition by setting challenging objectives for the company as a whole, hiring highly motivated employees, and rapidly promoting those who deliver on their stretch targets. When it comes to injecting ambition, one size does not fit all. Goals are a powerful tool to drive strategy execution. To harness their potential, leaders must move beyond the conventional wisdom of SMART goals and their entrenched practices. Instead, they need to think in terms of being FAST, by having frequent discussions about goals, setting ambitious targets, translating them into specific metrics and milestones, and making them public for everyone to see. Donald Sull, who tweets @simple_rules, is a senior lecturer at the MIT Sloan School of Management. Charles Sull is a partner at Charles Thames Strategy Partners LLC. 1. P.F. Drucker, “The Practice of Management” (New York: Elsevier, 1954): 109-110. 2. Mercer Global, “2013 Global Performance Management Survey Report Executive Summary,” accessed Feb. 16, 2018, www.mercer.com. The sample consisted of 1,056 organizations from 53 countries, and 85% were for-profit companies. The sample was weighted toward larger organizations, with 30% having more than 10,000 employees and 48% having between 500 and 10,000 employees. 3. According to the same Mercer Global survey, 94% of organizations conducted formal, year-end reviews of employees’ goals, and 89% of organizations reported that performance on goals influenced an employee’s performance appraisal, promotion, or bonus. 4. Various sources associate different attributes of goals with the five letters in SMART. The most common, however, are the ones we’ve listed. For a review of popular attributes associated with the SMART acronym, see the Wikipedia article on SMART criteria, https://en.wikipedia.org/wiki/SMART_criteria#Current_definitions, accessed March 20, 2018. 5. D. Sull and M. Escobari, “Success Against the Odds: What Brazilian Champions Teach Us About Thriving in Unpredictable Markets” (Rio de Janeiro and Cambridge, Massachusetts: Editora Campus, 2005). 6. The first author served as an unpaid adviser to BetterWorks from 2014 through 2016. He did not receive any funding, compensation, consulting fees, equity, or stock options. We conducted our analysis on a sample of 79 companies that were active BetterWorks customers in the first quarter of 2017. The information technology sector accounted for 44% of all companies in the sample, followed by health care (12%), and consumer discretionary (7%); 70% of the companies were headquartered in the United States and 14% in Europe. 7. We gratefully acknowledge the help of Shezal Padani, J. Michael Wahlen, and Moshe Barach in analyzing the BetterWorks data. 8. “The Impact of Employee Engagement on Performance,” 2013, Harvard Business Review Analytics Report, Figure 7, accessed March 15, 2018, https://hbr.org. This study found that the second most important driver of employee engagement was “individuals have clear understanding of how job contributes to strategy,” with 70% of respondents citing it as very important in terms of its impact on employee engagement. Of the 568 managers who completed the survey, 42% worked for companies with more than 10,000 employees; all organizations had more than 500 employees. 9. D. Sull, C. Sull, and J. Yoder, “No One Knows Your Strategy — Not Even Your Top Leaders,” MIT Sloan Management Review, Feb. 12, 2018, https://sloanreview.mit.edu. 10. For an in-depth description of the survey methodology and sample, see D. Sull, H. Kang, N. Thompson, and L. Hu, “Trade-offs in Firm Culture? Nope, You Can Have It All,” MIT Sloan School of Management working paper, 2018. 11. R.S. Tedlow, “Andy Grove: The Life and Times of an American” (New York: Portfolio, 2006): 74; and J. Doerr, “Measure What Matters” (New York: Portfolio, 2018), chap. 2-3. 12. E.A. Locke and G.P. Latham, “A Theory of Goal Setting and Task Performance” (Englewood Cliffs, NJ: Prentice Hall, 1990) report effect sizes (Cohen’s d) ranging from 0.5 to 0.8 of a standard deviation of task performance for individual goals. A more recent meta-analysis of goal setting on group (rather than individual) performance found an effect size of 0.8 standard deviation of performance. See A. Kleingeld, H. van Mierlo, and L. Arends, “The Effect of Goal Setting on Group Performance: A Meta-analysis,” Journal of Applied Psychology 96, no. 6 (July 2011): 1,289-1,304. 13. R.D. Pritchard, M.M. Harrell, D. DiazGranados, and M.J. Guzman, “The Productivity Measurement and Enhancement System: A Meta-analysis,” Journal of Applied Psychology 93, no. 3 (May 2008): 540-567. The average team improved their performance by 1.16 of a standard deviation of task performance in this meta-analysis. 14. In our survey of strategy execution, we asked respondents in 131 organizations how often they created new objectives for themselves and their teams, and 56% answered once a year. (This was similar to another survey in which 54% of organizations said they revise their goals once per year or not at all; see S.S. Garr, “High-Impact Performance Management: Using Goals to Focus the 21st-Century Workforce,” Bersin by Deloitte, December 2014, page 11). 15. Based on the sample of 79 BetterWorks customers. 16. Doerr, “Measure What Matters,” 14. 17. “The Management Framework That Propelled LinkedIn to a $20 Billion Company,” First Round Review, 2016, accessed March 24, 2018, http://firstround.com. 19. S.B. Sitkin, C.C. Miller, and K.E. See, “The Stretch Goal Paradox,” Harvard Business Review 95, no. 1 (January/February 2017); D. Markovitz, “The Folly of Stretch Goals,” Harvard Business Review, April 20, 2012, https://hbr.org; and L.D. Ordóñez, M.E. Schweitzer, A.D. Galinsky, and M.H. Bazerman, “Goals Gone Wild: The Systematic Side Effects of Over-Prescribing Goal Setting,” Academy of Management Perspectives 21, no. 1 (February 2009). 20. Doerr, “Measure What Matters,” chap. 12-15. 21. R.M. Cyert and J.G. March, “A Behavioral Theory of the Firm” (New Jersey: Prentice Hall, 1963); H.R. Greve, “A Behavioral Theory of R&D Expenditures and Innovations: Evidence From Shipbuilding,” Academy of Management Journal 46, no. 6 (December 2003): 685-702; and O. Alexy, E. Bascavusoglu-Moreau, A.J. Salter, “Toward an Aspiration-level Theory of Open Innovation,” Industrial and Corporate Change 25, no. 2 (April 2016): 289-306. 22. C.S. Dweck, “Mindset: The New Psychology of Success” (New York: Ballantine Books, 2008). 23. D. Sull and M. Escobari, “Brahma Versus Antarctica: Reversal of Fortune in Brazil’s Beer Market,” London Business School case study (2005). 24. C.P. Cerasoli, J.M. Nicklin, and M.T. Ford, “Intrinsic Motivation and Extrinsic Incentives Jointly Predict Performance: A 40-Year Meta-Analysis,” Psychological Bulletin 140, no. 4 (February 2014): 980-1,008. In table 4, the authors report the relative contribution of external incentives and intrinsic motivation on performance for different types of tasks. For simple repetitive tasks, intrinsic motivation accounted for 42% of the explained variance in motivation, while financial incentives accounted for 58%. For tasks that required absorption in the activity, a broad approach, and more creativity, intrinsic motivation accounted for 85% of explained variance in motivation versus 15% for extrinsic incentives. As part of its sustainability strategy, organic yogurt company Stonyfield has made a mission of total transparency in its sourcing. Disrupting the status quo is often valuable, but taken too far, it can lead to ethical crises. If you are interested in learning more about how to use goals to drive strategy execution, check out our free webinar on Thursday, June 6th at 11 am Eastern. Sign up details below. We’ll expand on the materials in this article, and leave plenty of time for questions and answers. Unfortunately, the FAST acronym is as bad as SMART, for a common reason: The illusion that over-simplification (for the purpose of easier communication) can substitute a SYSTEM, which is a complex model, but made of simple principles and components that are inter-related and inter-dependent. How complex? A model is a simplification of reality (think of a map, which is a simplified model of the actual terrain). But its level of complexity is always proportional to the complexity of an organization and its business context. Could you mange a company strategically with OKR? Maybe, but only if it’s a 20-50 employees company, with a single product/service, operating in favorable context, less affected by VUCA (Volatility, Uncertainty, Complexity and Ambiguity). In other words, a context in which the Strategy and its execution doesn’t matter that much. Any other company, will find out how the OKR can kill their business, as soon as the competitive context gets less favorable and/or the business becomes more complex. Mihai, appreciate your interest in our work. Want to clarify a few points. First, our entire point is that FAST goals are a tool (like simple rules) for employees to self organize in a complex system. By making goals transparent, employees can understand what their colleagues are doing and how their work fits into the bigger picture. Frequently discussions organized around shared goals facilitate self-organization in complex systems. You write “Could you mange a company strategically with OKR? Maybe, but only if it’s a 20-50 employees company, with a single product, operating in favorable context, less affected by VUCA” Your assertion is not consistent with evidence. Many complex organizations operating in volatile markets (e.g., Alphabet with 88,000 employees and AB InBev with 200,000) use FAST goals to self-organize. Larry Page considers OKRs more crucial as the company gets bigger, and 3G the private equity group that controls AB InBev has rolled them out to all its portfolio companies because they work so well. Our article provides an evidence-based tool to manage complex organizations in volatile markets. The comment I would like to add has to do with the problem I ran into early in my career as a business process engineer; the problem of ‘goal clarity’ or lack thereof as the primary culprit leading to under-achievement and less than optimal productivity. I have never seen anything about this until a recent article appeared on the comparably.com blog entitled: The Scoop on Stress – Having Unclear Goals Is a Big Problem for Many. The survey of 88,000 people revealed 42% of workers across every gender, department, and age group say having unclear goals is their top source of stress. ‘Commute’ and ‘bad manager’ trailed a distant second (tied at 16%). What is significant about this for me, is that for most of my career, I have differentiated the the ‘goal’ itself as an ‘object’; distinct and apart from the varied process systems and practices (e.g.) SMART, FAST, MBO, etc., employed in the development and execution of the ‘goal’. Thus, the ‘clarity’ characteristic of a goal, if carefully crafted to reflect ‘acceptance’ by the key stakeholders associated with and responsible for its achievement, is the keystone against which existing (SMART) and emerging (FAST) goal development and achievement processes can be applied and improved. I would like to reinforce the importance of the Comparably.com survey finding that ‘unclear goals’ are much more important and causal to goal failure than most managers are even aware of. And of course, goal development and execution processes and practices need to be continuously improved (kaizen) as the data indicates. 1. The deliberate act of establishing clear, consistent, measurable goals according to a standard. 2. Aligning the inter-operability of those goals among the various business specialties of the organization. 3. Adjusting performance against goal measurement data (as it is collected) to improve performance across the organization. 1. The conclusions of Donald Sull and his team were based on the evidence of analyzing half a million goals and reviewing the academic literature on goal setting. 2. What is it and why is there an acronym? 3. What is the main problem with management by objectives? Since its creation, it has promoted and encouraged individual performance. 4. What are the main challenges for a new system of management by objectives? 4.1 The new system must ensure integration with the strategy development process. 4.2 The new system should ensure coordination and collaboration among system participants. 5. The SMART acronym for goals applies to companies operating under a stable business environment. The new FAST acronym for goals is intended to be applied to companies operating under a dynamic business environment. 6. It would be interesting to compare the characteristics of SMART Goals and FAST Goals. Thank you for a thought-provoking article and research. I agree with Mihai’s comment and I think Javenega’s as well. The research is valuable however I wonder if we are focusing on the right target. My issue with Management-by-Objectives, and by extension my concerns with variations on it, is the MBO focus on individuals – and its lack of focus on the system. Let’s for a start examine the word employee. Everyone is an employee, but by using this word are we (unconsciously) reinforcing the notion that there is some difference between management employees and others? Well there is a difference actually, but perhaps not that implied by the word ’employee’. The difference is that by definition in a knowledge economy, knowledge workers (employees if you like) know more about the job then their bosses do. So, for the purposes of this comment I will use the word ‘workers’. Back to the matter under discussion – the notion of frequent discussions between workers is a good one, but their focus should not be, in my opinion, on goals. Their focus should – rather – be on identifying constraints in the system, agreeing on which one is the most important constraint, and then addressing it; once addressed move to the next (Theory of Constraints method – Systems Thinking framework). By contrast MBO has been proven to not work in areas where work must be delivered by groups working collaboratively across organisational silos; adjusting things at the fringes of that isn’t going to help the fundamental problems with the thinking. I love Peter Drucker for his insight that ‘Culture eats strategy for breakfast’ and for many of his other ideas which today form the basis for how the best companies are operating, but I can’t help feeling that if he were around today, he would be de-emphasizing MBO, and backing away from his notion that the ‘back-room’ could be out-sourced. We know now that the back-room (the system) is part of strategic competitive advantage for organisations, and you don’t outsource your competitive advantage. Lean manufacturing is the proof of that, as is, in the emerging economy, the adoption of agile and devOps concepts, frameworks and practices, which are in fact all based on lean manufacturing. It is proof, that is, for those organisations, that are adopting global reference frameworks and through disciplined repetition and practice of shared approaches are gaining mastery in them. I think this is a great article, but I see the use of both FAST and SMART goals. For strategic goals and strategic objectives (that support the strategic goals) I see using the FAST system. For Strategic Action Items, the items that grouped together will achieve the strategic objective, I can see using SMART goals. So SMART wouldn’t really be a formula for a goal, more of a formula for an individual action items that supports the objective or goal. The issue with goals as I’ve consistently observed is the lack of sufficient thought from the CEO and the rest of the C-staff behind the why goals should be implemented and the process to support goals. Too often it’s an after thought forced on front-line managers to impose on the non-management workforce. So, having any form of process is OK but not solving the larger problem where the Business hasn’t given enough thought into why have goals? What is the Business hoping to achieve with instituting goals? It needs to be a top down, transparent objective based exercise so the workforce is able to drive the right level of goals without duplicating efforts and each individual is providing value that roles up into the larger corporate goal. Asking employees to write goals to achieve a financial bonus or other compensation without knowing or understanding the larger business goals and knowing where they fit into the equation will generate confusion, frustration and ultimately busy work without value to the business which costs the business twice in lost opportunity and the EOY compensation payout.